The ACR3901U from ACS is a Bluetooth contact smartcard reader that brings together sophisticated smartcard technology and modern design. Ideal for use with most Bluetooth-enabled devices, this reader supports ISO 7816 smartcards and most memory cards in the market. 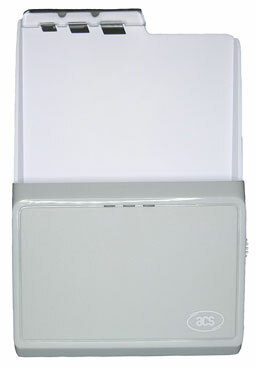 The ACR3901U is a compact portable reader that features a rechargeable Lithium-battery and both USB Full Speed and Bluetooth 4.0 interfaces. Supporting devices running on Android (4.3 and above), iOS (5.0 and above), Windows and Mac OS, this reader is in-field firmware upgradeable and PC/SC as well as CCID compliant. Drivers available for Windows, Linux and Mac OS.